A major and important part of any surgical procedure is to re-position the raised flap (in surgery) or the injured tissue in case of injury to a position where it helps in healing. The healing which is initiated by proper suturing is called as healing by Primary intention. Suture material is an artificial fibre used to keep wound together until they hold sufficiently well by themselves by natural fibre (collagen), which is synthesized and woven into a stronger scar. Suture is a stitch/series of Stiches made to secure apposition of the edges of a surgical/traumatic wound (Wilkins). Apart from these two major intentions, a proper suture helps in preventing Hemorrhage or blood loss, prevents Tissue necrosis and also helps to bring back the normal contour and shape of tissues. Suture materials are chosen if they can qualify with the following properties of suture materials – Tensile Strength, Biocompatibility, Easy of tying, Least tissue irritation and reaction, Diameter and size, Coefficient or friction. Resorbable Sutures: These materias resorb on their own after a certain period of time in the oral cavity due to Antigenic Reaction and the Acidic Environment in the Oral cavity. There is no need to remove these sutures after surgery and can be left in the surgical field. These are used in closed type of cases where it is not advised to open the surgical site in future. Non Resorbable Sutures: These are Suture materials which do not resorb and are required to be removed after healing of the surgical site. These are mainly used in open or accessible regions. Silk sutures – These are cheap and easy to handle and use and are the most used suture materials in dentistry. Some problems with Silk suture is that it is multifilamented which means there will be food impaction and must be cleaned properly to avoid infections. A Surgical Needle is the carrier of the Suture material through the tissues to be approximated. The size and shape of the Suture needle differs based on the location, tissue and type of surgery performed. A Surgical Needle is divided into three parts – Needle point, needle body and swagged or press-fit end. The most commonly used needle sizes in dentistry are 3/8 and 1/2 circle needles. Round Needles: These are most commonly used and are less traumatic to the tissue but requires more force while piercing tissue. 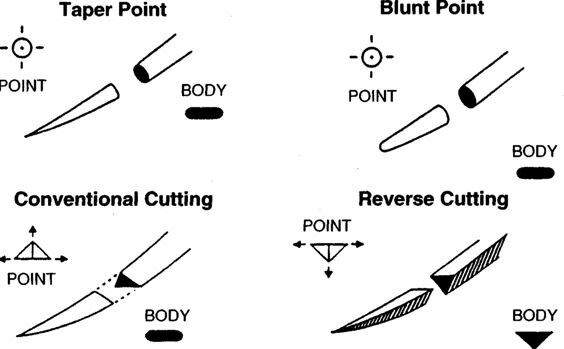 Conventional Cutting: The sharp tip is placed upward and care should be taken as the tip can easily tear the tissue, it is used in thick tissue regions. Slip Knot: It is mostly used with silk, plain gut or chromic suture materials. Surgeons knot: USed with synthetic resorbable and Polyster synthetic materials to prevent the knot from becoming loose before healing. Dentistry is a complex profession and a major part of it is Surgical procedures which require knowledge of Suturing techniques and as well as Suturing materials and the armamentarium used for Suturing. Proper Suturing plays a major role in the healing of any major or minor surgery as it helps in healing by primary intention and prevents and secondary infections to the surgical site. International Journal of Periodontics Restorative Dentistry 1998 Oct: 18(5): 474-87. Oral Tissue reactions to suture materials.